Students can download the CA Final admit card from this blog. THE EXAMINATION FOR ICAI MAY 2019 OLD FINALS/NEW FINAL GROUP 1 IS BEING HELD ON 27th, 29TH, 31st MAY, AND 2nd JUNE 2019 AND GROUP 2 WILL BE HELD ON 4TH, 7TH, 9TH, AND 11TH JUNE 2019. THE LAST DATE FOR REGISTERING FOR ICAI MAY 2020 OLD/NEW CA FINALS EXAMINATION IS 12TH MARCH 2019 AND 16TH MARCH 2019 FOR LAST FEE APPLICATION. Both Groups of CA Intermediate must be cleared. The Student has completed 2.5 years of his Articleship. He/she must be registered for CA Final before the last date of exams forms filing which is usually 3 months before the attempt. Final Registration at least before Nov 2019 for new course Final.registration. The procedure to procure your admit card in the new syllabus is the same as the old method. How Can I Download My CA Final Admit Card May 2019 From ICAI Website? Click on the link in front of AdmitCard Your admit card and the “Instructions to Examinees” will appear on the screen. You can then print the same in A 4 size paper. Q. What is Admit Card? Admit card is the document which validates your registration to the examination. Q. What details my CA Final May 2019 Admit Card carry? Q. What are the important things to be kept in mind regarding the CA Final Admit Card? You should download the pdf format of your admit card and then take a printed copy as ICAI gives you only 3 chances to download your admit card. If you have pdf format with you, you can print it as many times you want. You should always carry photo ID like voter id or driving license along with admitting card to the examination center. Q. Does ICAI send CA Final May 2019 Admit Card through the post? No, ICAI has stopped providing admit card through postal service. The only way to get your admit card is through their website. Q. What should I do if I am not able to download my ICAI CA Final Admit Card from the website? You should immediately call at above helplines number and ask for their help. Q. When does ICAI issue Admit Card for May 2019? Admit card of CA final is issued 15 days prior to the commencement of exams, giving you ample time to go through the details and avoid unnecessary hassles during the examination. Q. Does my CA Final Admit Card May 2019 have my group details too? Yes, your admit card has your examination, group details along with your center and time of examination. Q. Do I need to use my PIN number to get my ICAI Final Admit Card? Q. I have got exemption in some paper, will that be displayed on my CA Final Hall ticket/Admit Card? No, admit card doesn’t carry any details regarding your past exam. The exemption is marked in your statement of marks through alphabet ‘E’ printed against the marks of the paper shows that marks of that paper are been brought forward from the previous attempt to be adjusted in this attempt. That you have been granted the exemption for that particular subject for next 3 years following exams. 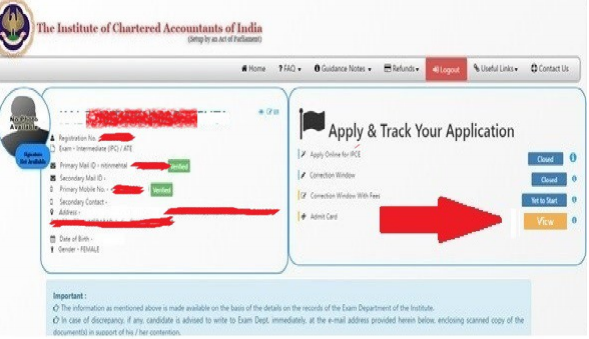 You can log in on ICAI website with your single credentials to on 15th April 2019, to check your exemption. Q. My photograph/signature is not there in the CA Final admit card May 2019. Is it valid? Yes. It is valid. In case the admit card does not bear the photograph and signature of the candidate, he/she is advised to paste the photograph and affix signatures in the area marked on the printout of the admit card and get this page attested by a member of the Institute (member may indicate his/her Name, membership number, and office stamp while signing/attesting at the bottom of that page) and carry the same to the examination center, in duplicate, as proof of his/her identity. He/she will be required to hand over the original attested admit card to the examination center, while retaining one copy of the same, for his/her own record. He/She is also advised to carry Two stamp size photograph (matching with the photograph affixed on the attested letter referred above) to the exam center for affixing the same at the appropriate place in the attendance register. Q. What should I do if I find any kind of discrepancies on my Admit Card for CA Final? immediately, quoting your registration number, barcode number of your examination form and receipt number issued by the regional office(s), if any, center opted (with the zone, if applicable), telephone number, fax number etc. You can send your admit card file to the following email.id referring them about your conversation and asking for needful. Q. Whom to contact in case of any technical difficulties? Q. What should I do if I forgot my password to log in? 1 login particular sent to registered email id. After giving details like registration number mobile.id, email id security question, and answer, your password will be sent to your email id. By giving details like registration no, exam application Barcode no, and PIN ( personal identification number)you can retrieve your password on the screen. We wish you all the best for your exams and keep yourself healthy and prepared.